8x10 glass negative photographed by James Burton prior to the America's Cup races which started on August 22, 1903. This image was taken on August 20th two days before the start of the races in New York Bay off New York of RELIANCE, the American defender and SHAMROCK III, the British challenger undersail, port beam view with spectator vessels in the background. RELIANCE was a 143' cutter built in 1903 by Herreshoff Manufacturing Company of Bristol, Rhode Island and designed by Nathanael Greene Herreshoff. 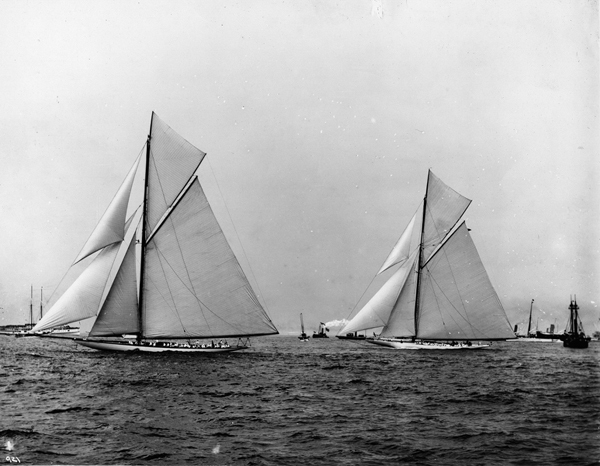 SHAMROCK III was a 134'5" cutter built by William Denny & Brother of Dumbarton, Scotland from designs by William Fife and George Watson in 1903. Handwritten on neg. sleeve: "B-921 / Start / 1-8x10 of Boat on LEFT / Cup race Aug 20/03 the start / no race". Handwritten info. from a piece of paper adhered to negative surface edge: "150-B14449". Handwritten lower margin on emulsion side: "Cup Race / Aug. 20 '03 / Copyright". Handwritten upper margin emulsion side: "The Start Aug. 20 no race".